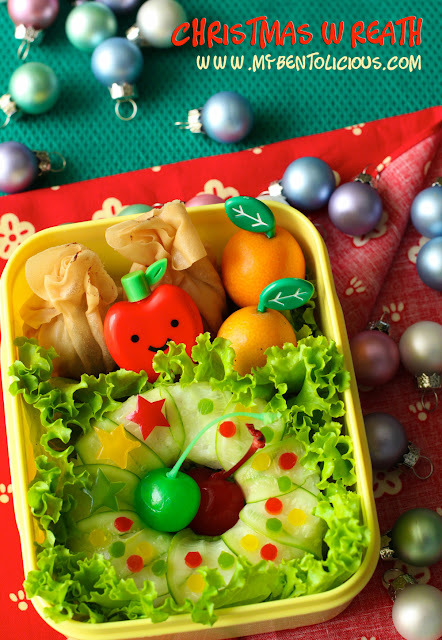 Christmas wreath for today's snack bento. It only contained 2 money pocket shapes fried dumplings, kumquat oranges, sweetened red and green cherry. Christmas wreath itself was made from white steam rice decorated with thin layer of cucumber and paprikas (green, yellow, red). Yesterday, my kids asked me to put our Christmas wreath at the front door because some of our neighbors who are Christian have put that on their front door. Hahahaha … I'm not the one who love to decorate our house with Christmas accessories, my husband is. The Christmas stuffs will be pull out from the box very soon. Hi Lia, I love the wreath idea! It's so simple, but looks nice with the little cutouts which you do so well... They look like tiny berries :) And goes so nicely with your teeny ornament balls scattered in the background. You set up such a pretty scene, I have to look at everything after the bento itself, so I stare quite awhile at the photo! Beautiful! Christmas is a great time to be creative in every kind of crafting ;) Even if you are not christian a nicely decorated house and bento is just fine! lovely wreath. i agree with sheri, was enjoying looking at the details - well done. Hey Lia Chen, you're very creative on this. I can already feel the Christmas mood in the air. your kids make me remember my childhood. I used to ask my friend who is Christiani to make a christmast decor in early December, because I like to watch the lamp in christmast tree..
btw Lia, i hope I have 25% of your creativity in making bento..
@Amaaris : Thanks a lot Amaa! Gorgeous wreath!!! I love the colors, they are all so nicely out together! This is fabulous! The wreath is inspired and I love how you placed your background props. A lovely holiday photo.